The story The Little Engine That Could tells of a small locomotive that was able to pull a long train over a mountain because it was willing to work hard and thought it could succeed. Successful bands are a lot like that. So is the FireStudioTM Mobile. This little audio-recording machine is ready, willing, and able to work hard and travel anywhere. The FireStudio Mobile features including six line-level inputs and two mic/instrument inputs with our sweet-sounding, high-headroom Class A XMAXTM mic preamplifiers. The FireStudio Mobile may be small, but it uses top-of-the-line components, including XMAX preamps and high-definition, 24-bit, 96 kHz digital converters, with 118 dB of dynamic range. In fact it offers the same signal path as our StudioLive-series mixers! And with PreSonus’ lauded JetPLLTM jitter-elimination technology, you get the tightest, most reliable digital sync in the industry. 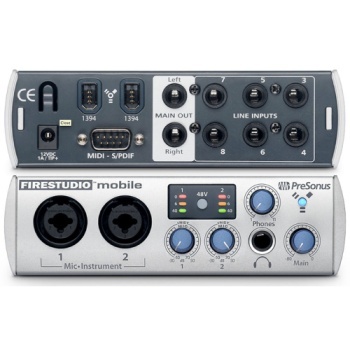 As a result, the FireStudio Mobile provides the sonic quality you need to succeed.